An old friend recently returned from a harrowing trip to the Sudan, where he worked as a doctor in a war-torn region of that struggling land. He's not a person of faith himself, not quite, but he'd been volunteering at a Catholic hospital. There, conditions are so desperate that the only doctors willing to endure it are the faithful, the insane, or some combination of the both. On his return journey, he found himself in encounter with two other Christian relief organizations, both operating out of the Yida refugee camp in South Sudan. One was Samaritan's Purse. The other was Voice of the Martyrs. The story of his return struck me, as he shared it, because it speaks volumes about how Christians actually witness to their faith in the world. There is the faith that knits up broken bodies, putting itself on the line. There is the faith that efficiently cares for the lost and the homeless, listens with a sympathetic ear, and tries to help. And then there are other ways faith expresses itself, ones that are less hospitable. Each bears witness to a particular way of understanding what Jesus taught. So here, I'll hand you over to him, and let him tell the tale. 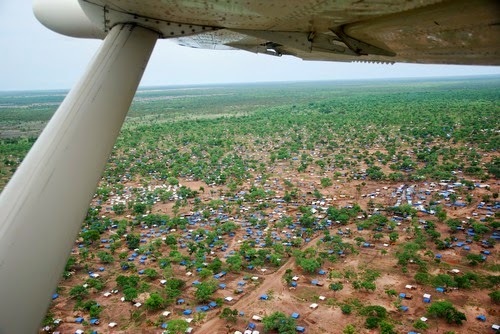 In February 2014, I was stuck in the Yida refugee camp in South Sudan, waiting for a plane back to civilization. The camp is a ghetto of refugees and NGOs, over 75,000 people uneasily crowded together in what used to be the middle of nowhere. Hot and dusty and dirty, the most attractive thing about Yida is its airstrip. Nothing sounds sweeter than the drone of a plane circling overhead preparing to land. Planes come infrequently but when they do, crowds of people run to the airstrip and beg for a flight out. I was stuck in Yida because the plane I expected was itself stuck in a small village in Kenya, at an airport that had run out of fuel. I was traveling on behalf of a Catholic diocese of Sudan, an "NGO" with not much money, so I was looking at spending several days or -- gulp -- even a week at our tiny camp in Yida, either sweltering on a cot in a tent or sitting at a card-table sipping warm water. That was all there was to do. The camp's single staff member Stephen couldn't tell me exactly when another plane might come. Could be tomorrow, could be the weekend. It wasn't safe to go outside the camp, especially at night. Often rival soldiers or tribes fired their guns; thieves were everywhere. Best stay put, I was told. I had brought one book with me; a boring book at that. As panic set in I thought about the sparkling UN compound I'd seen near the airstrip. Tall white buildings. A fleet of white trucks. A solid wall all around it, the compound as big as a small city. And in many of the windows -- air-conditioners! Didn't they have planes coming and going all the time? Could I catch a ride on one? Sure, Stephen told me. No problem. We just needed to register five days in advance. So if we registered now, I was guaranteed a flight out by the end of the week. And I would have to pay several hundred dollars. "But I'm a doctor on a humanitarian mission!" I cried. "This is an emergency! I'm needed at home!" Emergency flights could happen in two days. Still needed to register. And pay. Screw the UN, I thought. Puffed-up peacocks strutting around the sewers of the world blowing other people's money. I didn't need them. "Isn't Samaritan's Purse here?" I asked Stephen. He nodded. Samaritan's Purse was well-known in Yida. They had a big compound and were considered fair, efficient and dedicated as far as NGOs go. They had in fact taken over management of the three wells in Yida and were dispensing water in an orderly way; this after another NGO bailed on the job. That didn't surprise me. I had heard good things about SP for years, since 2008 when I first went to central Sudan to work at the diocese's hospital. SP didn't evacuate when things got tough. They helped out staff from other NGOs if they could, including getting them on planes. If anyone could help me, SP could. Stephen agreed to drive me over to SP's camp, and then to the UN -- to beg -- if SP didn't work out. Our truck drove past countless filthy children dressed in rags, swarmed by flies; angry-looking Dinka toting rifles; makeshift home after makeshift home; and past multiple other trucks carrying white people from the many other NGOs on site. The Samaritan's Purse compound was large -- not as large as the UN's -- and impressive for its orderliness. A solid external wall with a heavy security gate and staff at the gate to register visitors. Inside, it was clean, organized and sparsely populated, as many of its staff were off working in Yida or South Sudan. No tents to be seen, only real buildings of steel and wood. We were directed to the main administrative office after asking to see the guy in charge. The guy in charge turned out to be a twenty-something Californian named Jim. Completely friendly, low-key and without ego, he listened to my tragic story of being stranded in Yida and how it was vitally important for me to get home at once and not have to spend more than a single night in that sweaty tent. Did SP have any planes coming in? "Not for a week or so," he said, shaking his head. My heart sank. "But..." he grabbed a sheaf of papers. "You might be in luck." Another Christian relief organization, Voice of the Martyrs, had a plane coming in tomorrow, bringing three staff members to Yida and going back empty. Jim would check with the VOM guy in Yida to see if the seats back were free. How did that sound? "Thank you," I whispered. "Thank you so, so much. If there's anything you ever need ..."
Later that night Jim contacted Stephen and told him he had confirmed with VOM that the three seats on the incoming flight were reserved for me and for the two aidworkers I was traveling with. Our little group jumped for joy. Due to security reasons, Jim couldn't tell us exactly when the plane would land but he advised us to be at the airstrip around noon. The next day dawned bright and hot, as probably every day does in Yida. We were at the airstrip by 10 am, staring hungrily at an empty sky. Around noon we heard the beautiful sound of a single-prop plane engine; above us the tiny plane circled once, twice, then landed, shooting up a wave of yellow dust. Stephen hit the gas and our truck flew down the airstrip towards the plane at the other end. Suddenly I noticed four other trucks racing along with us, full of refugees -- men, women and children -- all heading for the same plane and a ticket out. No! Those seats were meant for us, the Americans! I'm a doctor! I thought angrily, selfishly, thinking of home and my daughters. A large crowd surrounded the plane as it parked and powered down its engine. The two pilots jumped out and unloaded cargo. Meanwhile three white men -- the passengers -- climbed out of the back. We hastily rushed them and introduced ourselves, thanking them profusely for letting us use their plane to get home. Stephen surreptitiously handed our bags to the pilots, who began to load them. Behind us the refugees stood muttering, many of them with papers clutched in their hands, likely documentation permitting their travel or indicating why leaving Yida was necessary. "Wait a minute," one of the VOM guys said, a guy named Rick. "Hold on. Nobody cleared this with me. We paid for this plane. Who are you guys again?" "Yeah, yeah," he said. "You guys do good work up there. But this is our plane." "Jim from Samaritan's Purse told us the seats were already reserved. He talked to someone named Abdel." "Doesn't matter what Samaritan's Purse said. It's not their plane. Abdel decides who goes on the plane, and promises have already been made." "Yeah -- Abdel. That's who -- "
Rick turned to the pilots. "Take their stuff off the plane. Unload it! We need to figure this out. Abdel, come here." The pilots dropped our luggage on the dusty ground. It looked like I would have to get used to the tent. A short, thin Sudanese man came up and seemed to have no idea who we were. "Jim told us he talked to you. We have a letter here from him -- "
"Abdel doesn't need to see that," Rick snapped. "He's the one who makes the decisions. It's up to him. A lot of people want to get on that plane, and VOM paid for it, not Samaritan's Purse." I noticed Rick talked a lot about who had paid for the flight. "Well, uh, we could pay ... ?" I offered weakly. "Come on, Abdel, let's talk," Rick said. He put his arm around the smaller man and led him away. A heated argument ensued. Finally Abdel came back. He stared at the crowd. "The people going on the plane are ..... Him! And Him! And Him!" And he pointed to our group. The refugees groaned. Ecstatic, we helped the pilots reload our things. Abdel sidled up to me. "How much you pay?" he asked. "Oh - uh..." I checked my cash. $300. "I can pay $300." "OK, good, good. Each of you pay $300." The other two men agreed and we handed over the cash. In a few minutes everything was packed and we were belted in the back of the tiny plane. The crowd stared at us blankly, resigned I guess. I didn't care. I was getting out of Yida! The propeller roared into life and we slowly rolled forward. Technology, comfort, civilization! Rick ran up to the moving plane and hammered on the hatch. The pilot stopped the plane. Opened the door. "Hey!" Rick yelled. "You guys were supposed to pay $300 each! There's only $700 here!" The three of us looked at each other. "I guess that's all we've got!" I said. "Can't I send a check -- or use a credit card -- when we get back? I'll --"
Rick shook his head, disgusted. "Forget it," he almost spat. "Get out of here." He slammed the hatch shut. The plane taxied and took off. Thirty-six hours later I was home.